This collection of 400+ postcards, depicting buildings and scenes of Portsmouth and the Seacoast area, was donated to the Portsmouth Public Library by the family of Louis J. Mackles in May of 2015. It was given specifically by Ross A. Moldoff, Gloria F. Moldoff and Harold Moldoff, who felt the collection should be made available for study and enjoyment. The rehousing of the physical collection into archival albums was made possible by the Moldoffs as well. Mr. Mackles collected postcards throughout his life. This collection, only a small portion of a much larger number, left behind for family and friends to enjoy, is an interesting historic journey through the Seacoast. Some buildings depicted are long gone while multiple postcards of the same building show the progression of time. Postcards (aka "post cards") became popular at the turn of the 20th Century, after being introduced to the U.S. during the Chicago World’s Fair in 1893. Used primarily for sending short messages to friends and relatives, people collected them immediately as mementos of a trip or journey, historical events, holidays, etc. They were sold to tourists and often advertised local businesses. Individuals created real photograph postcards to send home to relatives when travelling abroad as well. Immigrants to the U.S. often had photos taken when they arrived at their destination to send home to their native countries. DELTIOLOGY is the hobby of collecting postcards according to Merriam-Webster, but more broadly it is considered the collection, study, and preservation of picture postcards for fun, recreation, relaxation, and enjoyment – and for the historical preservation of life in years past [As described by the American Association of Philatelic Exhibitors http://www.aape.org/collectingpicturepostcardsver17jul.asp]. The Mackles collection was primarily published in the U.S. and Germany and contains many different types of postcards. The standard photo cards, printed and colored or tinted cards, several fold-out strips which became popular in the 1950’s, as well as miniature postcards. ‘…Maj. Mackles attended A&M and UNH, receiving a master’s degree with high honors in chemical engineering. He served in the Philippines during World War II, retiring as a major in the U.S. Army Reserves. He was the recipient of the Purple Heart and the Bronze Star. He retired after 30 years as head of the Radiation Control branch of the Portsmouth Naval Shipyard working with Adm. Rickover. Maj. Mackles was a consultant for L.P.I. Engineering in Dover until April 1987. We are gathered here today to mourn the passing of Louis Mackles, Label ben Yudel u Miriam, and to speak about his life. Lou, as everyone called him, was born October 4, 1923, the second of two sons, to Idel and Mary Mackles, in Brownsville, TX, and grew up in Galveston, TX. As a young man, he attended Texas A & M for two years. In 1942, when the U.S. entered WWII, he enlisted in the Army. After achieving the rank of Corporal, he was sent to Officers Candidates School in New England. In 1944, before being sent overseas, Lou and his fellow Jewish soldiers attended services at Temple Israel of Portsmouth. Then Rabbi Oscar Fleishaker had urged his congregant families to welcome the Jewish soldiers, and so it was that Lou met Charlotte, the girl he was to marry. Lou was commissioned a second Lt. and sent to the Philippines. During an enemy attack, Lou Mackles, despite being wounded himself, saved the life of a wounded comrade, and refused to leave his men. In addition to his wounds, he developed pneumonia from exposure and might have died, had friendly natives not taken him to an Army field hospital – a three-day journey on foot. Army doctors saved his life. Lou was awarded a Bronze Star for bravery under fire. He also gained a lifelong respect and love for the Army, and it was his wish, in the last days of his life, to be treated in a military hospital, this time at Pease Air Force Base. Following the war, Lou served in the Army Reserves, finally retiring with the rank of Major. After his discharge at the war’s end, Lou married Charlotte in Boston on Jan.1, 1946. He then attended the University of NH, attaining his Bachelor’s and Master’s degrees in Chemical Engineering, becoming a professional engineer licensed in both NH and Maine. Son Glenn was born during this period. Then followed a 3-year stint in Wash., DC, where Lou worked for the Bureau of Standards. 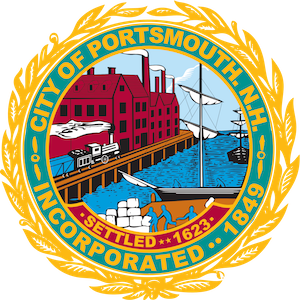 Thereafter, the family settled permanently in Portsmouth, where daughter Linda was born. Lou took a job at the Navy Yard, where he spent approximately 35 years, working his way up to head of the Radiation Division, building nuclear submarines. Lou was part of the team that produced the Albacore, among other submarines, he served under the legendary Adm. Hyman Rickover. During his years at the yard, he was honored by being asked to present a gold plate to the sponsor of a nuclear sub – which Navy Yard personnel regarded as the highest honor attainable. But more importantly, Lou was well-respected and liked greatly by his colleagues at work, many of whom stayed in touch over the years. It is symbolic of how well-liked he was that old service buddies and friends from work would stay in touch. When Lou became ill, friends would often call the family to find out how he was doing. About 10 years ago, Lou retired from the Yard and worked as a consultant for a private engineering firm in Dover. What sort of man was Lou Mackles? Though I myself arrived in Portsmouth only during the last months of his life, I have the testimony of those who knew and loved him. His family and friends can testify that he was a quiet, soft-spoken man who never said an unkind word about anyone else. I can tell you that he loved children, and was happy to serve as Scoutmaster in a boy scout troop when his children were young. But is more of an eloquent tribute to his memory that, when the little boy who lived across the way from the Mackles was told of Lou’s death, he burst into tears. Lou worked hard, often putting in 18-hours days at the Yard, but he was devoted to his family as well. He was proud of his children’s accomplishments, and loved them unquestioningly. He was also especially close to his nieces and nephews, and was godfather to many of them. As for hobbies, Lou was especially good with his hands. He enjoyed gardening, photography, furniture finishing, and working around the house. He himself did much of the work on the home which he and Charlotte built on Moebus Drive. Golf was a great love, as well. But Lou’s sense of involvement went beyond job, family and hobbies. Having been raised in a traditional family, he retained a strong respect for Judaism, leading him to become an active member of Temple Israel. He served on the Religious Committee, volunteered as an usher on the High Holidays, and helped run the bingo program. Even when he became ill, he refused to take his medicine on Yom Kippur, preferring to fast completely. When, 6 years ago, Lou discovered he had cancer, he determined to fight it. Recalling his WWII bout with combat wounds and pneumonia, he said, “I was supposed to be a goner in the Philippines, but God gave me 40 more good years.” He fought with courage and determination that serve as an example to us all. Lou was a quiet man who never complained, who did not wish to be a burden on anyone. But he was a fighter to the end, a self-made man who loved life, who loved people, who made every minute count of the years he was given. His memory will be cherished by all who knew him. Our religion speaks of the resurrection of the righteous dead. It is one of the most fundamental beliefs of our faith, but one of the most difficult to comprehend. I myself believe that our resurrection depends, not only upon the grade of God, but on the memories we leave our friends and loved ones. Anyone who touched as many lives as did Lou Mackles will surely merit resurrection and eternal life. He will be deeply missed. This collection was digitized by Jessica Ross with volunteer help by Wynn Welch, Spring/Summer 2016. Please see below for copyright information. Please contact the Portsmouth Public Library, Special Collections Room, if you have any questions. 603-766-1720.